Muslimbuntu is an out-of-the-box Linux system which is spiced up with Islamic flavour. Through a precise geo-location acquisition and database mapping, the exact prayer times are determined and being played at maximum volume settings. Your desktop is transforming into “burka-mode” and all interface elements are inaccessible during prayer times. Muslimbuntu is perfect for Muslims who speak and read Arabic. Many useful language tools are pre-installed, right-to-left writing direction is a system default and is fully supported. 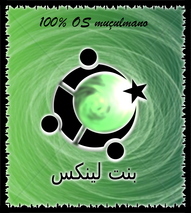 Comparatively strict and dogmatic life-style is depicted through scheduled events that take place on the Desktop of Muslimbuntu; it is a useful companion for any contemporary Muslim – automatic reminders will keep you aligned to the religious calendar, visual esthetic will help to preserve the unique style. Additionally – prayers collection can be updated via a RSS subscription.